David Brett was born in Bridgewater, Plymouth County, Massachusetts on April 22, 1816, the seventh child of Joseph and Olive Beal Brett. He was born of staunch New England parentage, being the seventh generation of William Brett, his illustrious forefather, who had come to America in 1639 from Kent, England in order to escape the religious persecutions of his native land. William Brett (1618-1681) was a man of considerable wealth and a notable land owner in the new colony and he had--with John Alden, Miles Standish, George Soule, John Rogers, and Constant Southworth of Mayflower fame--founded in 1649 the town of Bridgewater, from which in 1819 the town of North Bridgewater had been organized through a petition signed by the residents of the northerly section of the old town. Among the signers may be noted the signatures of David's father and uncles. Brett was forty-six when he answered his country1s call and on the 23rd of July he enlisted in the then being organized Ninth Battery, Massachusetts Light Artillery, giving his age as forty-three. Brett's health apparently was exception, he lost no time on sick leave during his entire enlistment, and he visited the doctor only once, in March 1863 to have his head bandaged after receiving an injury. Brett was very apt in the art of making money and while with the battery collected old iron and rags and would sell them in Washington and Alexandria. He also bought tobacco and condensed milk from his nephew in New York, reselling it at profit to the members of the battery. He always appeared to be in fund and would frequent his wife's meager wages as a seamstress. He was a frugal person-he neither gambled nor drank. Brett took great pride and satisfaction in his family, and it hurt him when his brothers and sisters did not write him, but he was concerned most of all with the welfare of his wife. 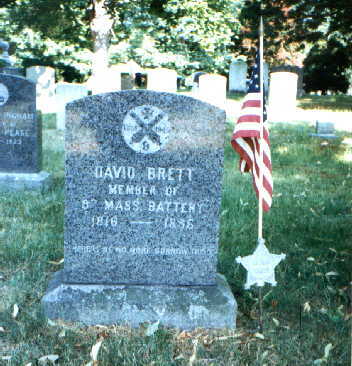 Not only was Brett loved by his family, but he was also admired by his comrades in arms, whom he wrote about as "the boys", and who affectionately dubbed him "Uncle David". At Gettysburg, after the battery had made their gallant stand and were falling back under the withering fire of Barksdale1st Missippians, Brett, losing his cap, went back to retrieve it, when one of his comrades, risking his life, took Brett under his arm and led him off the field to safety--such was the affection of his brother cannoneers. Like most soldiers, Brett grew tired of the war and wished for peace and to return to his home, and while he was convince young men should volunteer to put an end to the rebellion, he would not take advantage of his advanced age to seek a discharge. His loyalty to his country was abundant and his pity for the destitute condition of the rebel inhabitants in Virginia was great. The battery was mustered out on June 6th, and Brett was discharged 3 days later. When Brett returned to North Bridgewater he obtained employment as a sole leather cutter in one of the shoe manufacturing plants for which the town was becoming noted. The town was, in 1874, renamed Brockton--to the disappointment of the old residents--and became one of the major shoe manufacturing centers of the nation. Brett, in later years, contracted partial deafness of both ears and lived to be eighty. He died of a heart attack on the May 15, 1896. He was laid to rest in in old Union Cemetery in Brockton.